This spectacular white gold halo ring features a magnificent blue oval sapphire weighing 4.02 carats. Centered on the edges of its shoulders are two trapezoid cut diamonds nestled amid two stunning halos of brilliant round cut diamonds. It is these round cut diamonds and their settings that we are most interested in today. 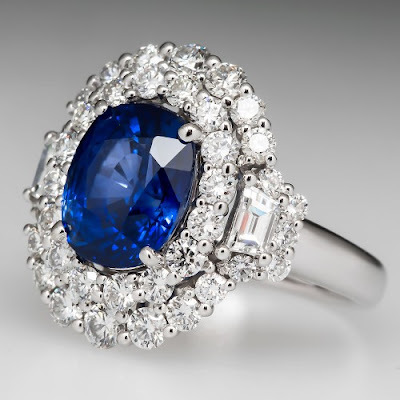 While the large sapphire is held in place by four metal prongs, the white diamonds are held in place by a traditional grain setting. Grain-set jewelry was historically created with a handful of beading (or graining) tools. The technique is typically employed when setting a number of equal-sized stones in lines. This setting is a highly specialized technique and therefore requires the skills of a seasoned master stone setter. It first gained popularity in the late 1800s and early 1900s, carrying through the Georgian, Victorian, Edwardian, and Art Deco periods of jewelry. All these grain-set jewels were crafted by hand, using a drill to cut all the holes in the metal and a beading tool to raise a bead of metal up and over the stone's four corners to secure it in place. Today, CAD jewelry design makes it possible to create grain-set designs without the labor-intensive process known in the 20th century. Thus, bead-set jewels are returning to contemporary style. While as many as six beads, as few as three, can be used to set a stone in place, four is the most common number of beads for a grain setting. Sometimes, a five-grain setting is chosen, in which four beads are placed at each "corner" of the stone and a fifth bead is set in between to give a visual distance between each stone in the row. Probably the most popular form of grain setting is the pave setting, in which a carpet of small diamonds cling to the surface of a setting to create a sea of bling. Each tiny diamond is set with beads, adding more shine and brilliance to the overall look of the piece. With this technique, the small stones are sunk to their girdles, set to nearly touch each other. With the aid of a hand tool called an onglette graver, each of the beads is cut and fashioned. After which, the stone setter uses a round graver is to roll the metal into position and lock the stones into place. In some cases, the grain setting is used without stones. This is a particularly useful technique on pieces that have areas of metal that are too small to mount with stones. Millegrain is a variation of this technique which adds interest and beauty to what would otherwise be a smooth, blank area on a ring or brooch. When purchasing a grain-set jewel, you'll want to inspect it carefully for quality. Well-crafted jewelry will always feel smooth to the touch. Any rough or splintery edges indicate poor craftsmanship. Inspect pave and micropave jewels under a loupe to ensure that stones are set tightly. Loose stones are an indication of amateur workmanship and should be avoided in the purchase of high-end jewelry. While inspecting it under the loupe, ensure that none of the diamonds or gemstones were chipped during the setting process. We cannot stress enough the importance of being willing to request of your jeweler that they demonstrate the quality and workmanship of every jewel they sell. Whether you're purchasing a new, vintage, or estate jewel, the quality of your investment should matter to you and to your jeweler. Young, Anastasia. Gemstone Settings. Loveland, CO: Interweave Press LLC, 2012, p. 121.